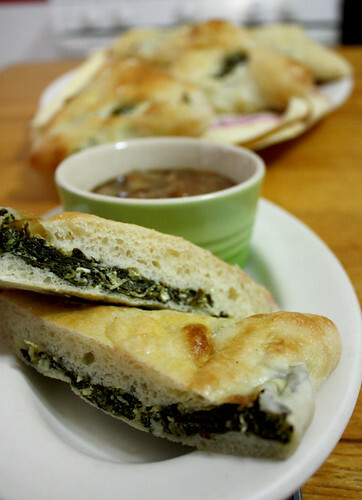 I love the spinach pies at my local Lebanese bakery with all their lemony spinach wrapped in a delicious fluffy pita crust. I’ve been wanting to make my own! Whenever I search for recipes though, all I can find are ones with phyllo crusts. Phyllo may be convenient since you can get it pre-made, but it always turns out soggy pies. 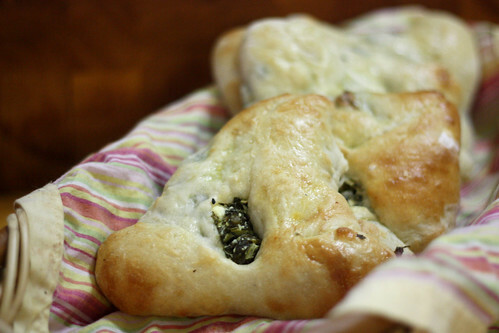 Since I can’t find any recipes for spinach pies with a pita crust, I decided to develop my own. I mean, its just a spinach pie filling in pita, right? Well, my guess was a good one and I was happy with the results. Try for yourself. Make Pita dough: Because the dough for the pita needs to raise, we’ll start with that. Mix yeast with warm water and let sit until foamy. Add sugar and stir until dissolved. In a mixing bowl, mix flour and salt. Make a well and add yeast mixture. Mix and stir while slowly adding another cup of warm water. Mix until elastic. I usually use my electric mixer when making bread dough, but pita dough is softer and I think works better when doing it by hand. **Time Saving Trick: To speed up this process, preheat oven to 250 degrees. When dough is ready, turn oven off and place dough in an oiled oven proof bowl covered with a towel and put into oven. Dough should rise in 30 minutes. 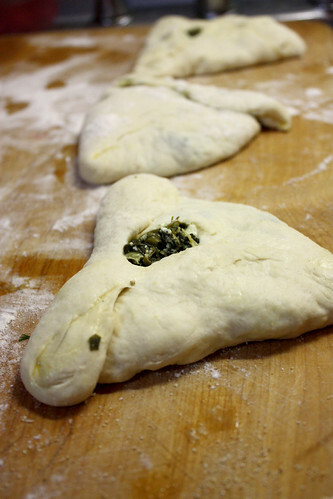 Make Spinach Filling: In a saute pan, cook fresh or defrosted spinach until wilted. Remove from heat and squeeze out excess liquid. You will probably have to do this in a couple of batches as spinach cooks down quite a bit. Saute scallions in a small amount of olive oil until clearish. 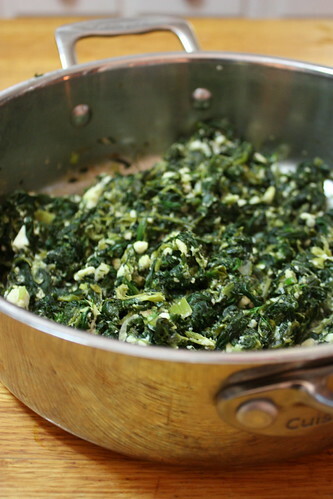 Mix spinach, scallions, feta, lemon juice and eggs and mix well. Place in saute pan and cook gently until eggs just begin to turn whitish, but the mixture is still juicy. Remove from heat. Taste and season with salt to taste. Bake Pies: Once pies are assembled, cover with a towel and allow to raise for 15-20 minutes. After raising, brush pies with remaining egg yolk. Place in oven and bake for 8-12 minutes, until pies are golden brown. Remove from oven, allow to cool and place in an air tight container. Stays fresh for a week or so. I ate one! It was great!